Brownie's YachtDiver brings you a sensational line of water toys that are sure to provide all the entertainment on the water any child or adults will want. 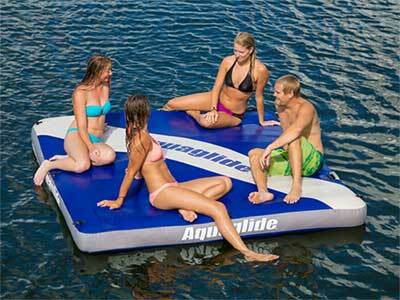 Contact Us for more inflatable water toys info. 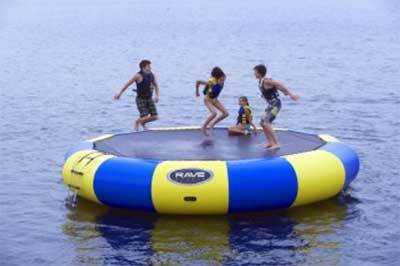 The Bongo 20 is a lightweight and portable water bounce and swim platform that is perfect for taking along on your yacht to bring water fun wherever you go. The Bongo 20 is our largest bouncer with a monster 20-foot diameter designed for 5 adults or 10 children. 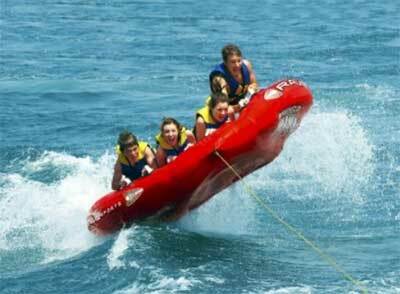 The Sports Mega Mambo Ski Tube provides a wild ride for anywhere from 1 to 4 riders. This exciting wing-shaped towable features eight foam-filled handles and an extra-wide anti-chafing guard positioned for four horizontal riders at a time. It'll stay stable over the biggest waves, fastest corners, and highest flights (yep, flights) that your driver can dish out. Additional Information8 foam-filled handles positioned for stability with 1 - 4 riders Neoprene knuckle guards 28-gauge heavy-duty PVC build 840 denier UV-stabilized nylon cover Bright red graphics with Mega Mambo logo Single front quick-connect tow point with Boston valve 680 lbs. total weight capacity. The exciting Warrior X3 towable tube! The unique design of the Warrior X3 tow tube allows for two sit on top riders and one prone with a large anti-chafe guard to protect elbows, 6 handles, and a quick connect tow point. 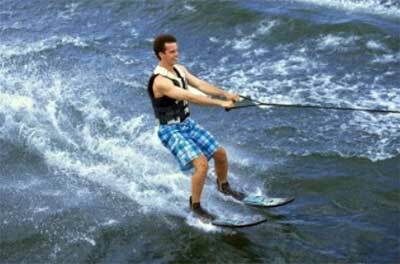 The Pure Combo water skis are perfect for recreational skiers at a variety of skill levels. RAVE's Pure Combo waterskis feature a square nose with narrow fin. The double density adjustable slide binding is soft on the inside for comfort, but stiffer on the outside for ankle support. Includes a slalom toe for riders who want to advance their skills. Soft step inserts cushion the riders foot. Constructed of RIM molded PU with a plastic laminate top and Fiberglass rods for reinforcement. Made in the USA. 170 cm. For riders over 125 lbs. The Lyric wakeboard features a 3 stage rocker for maximum air and a progressive edge that is rounded in the center and sharp on the top and tail, allowing the board to cut hard while forgiving during surface tricks. The Lycra lined Advantage boot features a multi-point adjustment system that provides a near custom fit for most adult shoe sizes. Constructed of RIM molded PU with Carbon Fiber reinforcement and a high density laminate core. Made in the USA. 141 cm long. For riders over 125. 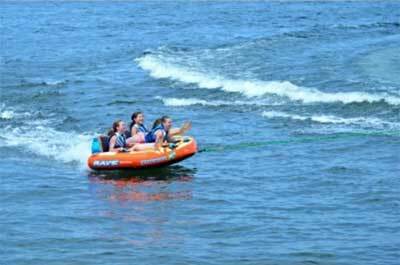 The Waterboggan 5 commercial towable is the perfect addition to your summer fun. 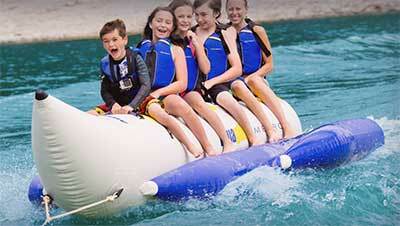 The Waterboggan 5 is a rugged in-line tube that gives thrills to riders of all ages, similar to the "Banana Boat". Made from quality, commercial grade materials that are meant to last. 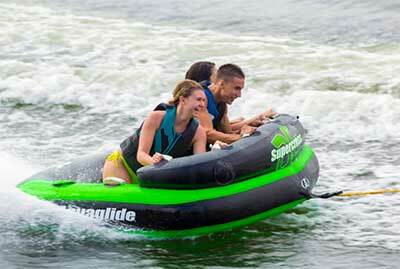 The Waterboggan 5 rider is designed to glide the fastest and delight the masses. 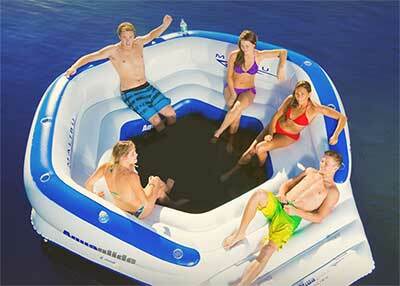 Keep your family, friends, guests, or campers satisfied with an exhilarating ride! Chelan HB is designed for touring, adventure and all-around use. The Chelan HB Series is one of the best selling touring designs on the market. With a long waterline, flat rocker, and fine, piercing bow, this kayak will provide you with great tracking ability and outstanding glide to cover long distances on your adventures with ease. Chelan HB boats combine our tough Duratex™ tube construction with the supremely rigid Hard-Bottom™ floor for an expedition-grade boat that will last for many years. This combination of materials in the Chelan's construction creates a stiff and responsive inflatable that performs just as well as a traditional hard shell kayak. The innovative Splash-Guards™ positioned fore and aft of the cockpit help keep paddlers dry, and the ample accessory straps grace the bow and stern providing easy stowage for dry bags or other gear. Sturdy molded handles are positioned around the boat for convenient boarding and transport. For added comfort the PRO-formance™ seats provide an array of thoughtful features including adjustable air cushion, high backrest, plentiful mesh storage pockets, integrated fishing-rod holders, and fore and aft seat straps so that you can enjoy your time on the water to its fullest. The high-performance fin system includes stiff, foiled fin with unique quick-release for easy setup and comes with a convenient backpack travel bag. The Supercross 3 is the biggest, baddest, and most amazing towable! Ultra-low deck seating maintains a lower center of gravity keeping passengers more secure, while the high closed deck design allows for a more relaxed ride with all of the excitement from any of our other designs. Comfortable shoulder height surround keeps riders secure no matter how extreme the conditions and, if you are looking for even more action, the Supercross can be turned around and ridden chariot-style for even more action packed thrills! 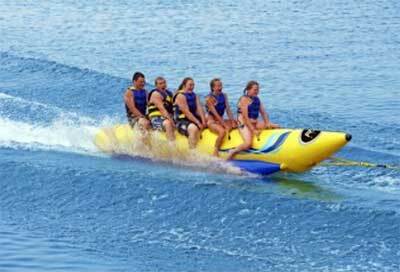 Metro is the most stable banana-style towable available on the market today. Built with commercial-grade DuratexTM and heavily reinforced at all handles and tow-points, the Metro is designed to provide many years of trouble-free service. It is available in 6, 5, and 3-person versions, with the two larger sizes offering double-wide stabilizer tubes for unsurpassed stability and performance.